If you want to leverage your sales efforts; if you want to grow revenues faster than expenses; if you want to lower your sales costs, you must – MUST – invest in developing valuable content to support your sales and marketing efforts. The most frequent conversation I’ve had following our webinar last week on Successful Lead Generation for B2B Companies is about the critical role content plays in successful lead generation. From the comments I’ve received, it’s probably the biggest surprise attendees left with. I’ve learned that content is not something many small and mid-market B2B CEOs think about. They spend a lot of time thinking about their strategies and tactics. They spend countless hours working with and addressing their people. They worry about pricing and competition, and they’re always tinkering to improve their products and services. However, with overwhelming neglect, they seem to ignore content. 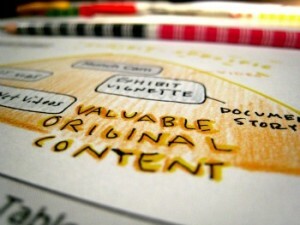 Content is the glue that enables a business to leverage its sales and marketing efforts. With valuable content (the keyword being valuable) you give your prospects a reason to pay attention to you. You are able to distinguish yourself. Without it, you are like every other peddler chasing down sales. If you are different, content showcases your difference. I understand that developing content is difficult, complex and, at times, painful. I realize that it’s typically not in the wheelhouse of senior team. I appreciate that the task can feel overwhelming. But, so is building a highly profitable businesses that consistently grows and creates wealth for owners and employees.